Digfender (Free) is basically a tower defense game combined with a “digging” game (if you couldn’t tell from the title alone). As far as the TD stuff is concerned, it’s all pretty standard. You’ve got waves of different enemies marching toward your base (a castle, in this case), and your job is to stop them by planting various weaponized towers in strategic places that will slow or kill the hordes. The towers themselves are pretty typical, too, with a fire tower, shock tower, freeze tower, and bomb tower, each with branching upgrade paths a la Kingdom Rush (Free). On top of that, you’ve got several support towers that connect to the weapons to boost things like damage, range, and gold drops. Where things get really interesting is in the digging aspects of the game. 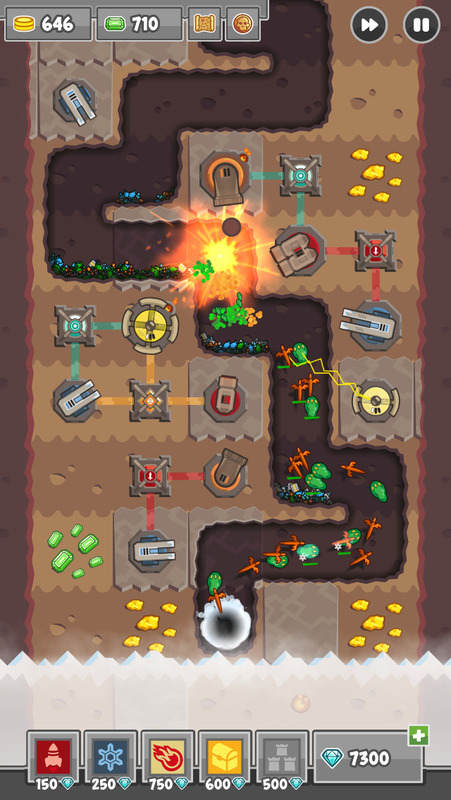 See, most tower defense games handle enemy paths in one of two ways: either with fixed paths that you have to place your towers around (like the Sentinel games) or by using the towers themselves to create your own path (like the Fieldrunners games). 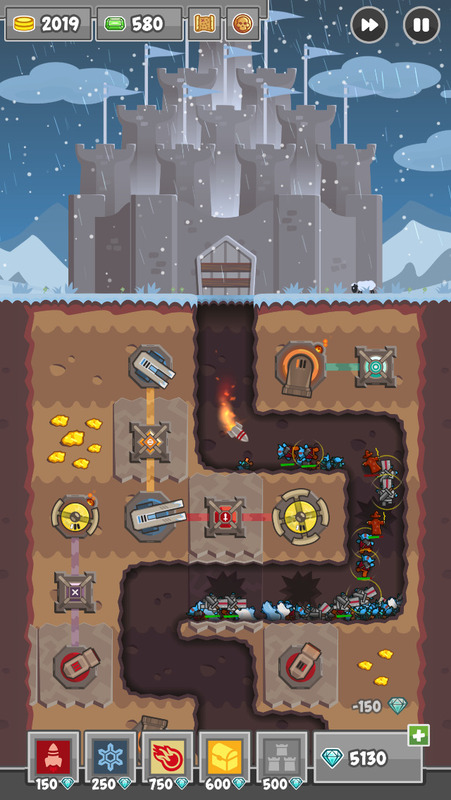 Digfenders essentially combines those two designs by actually letting you tap out your own path through a level first (by “digging” down) and then placing the towers wherever you want around that path. It may seem like a small difference, but it adds a surprising amount to the gameplay. It’s basically the best of both worlds. It keeps the creative aspect of making your own way through each level, but you don’t have to worry about running out of money while doing so since digging doesn’t cost anything. Of course, if you could just plow through each stage with no restrictions things would get too easy or too boring (or both, most likely) so the game wisely adds in special blocks that you can’t dig through and other blocks that you can’t build any towers on top of. More importantly, in most levels you can only dig down through five or so layers of dirt before the round starts, and from then on you can only dig one layer further after each successful wave. It all works brilliantly, and manages to strike a near-perfect balance between having room for lots of different strategies while remaining incredibly simple to grasp. The digging aspect of the game isn’t just a clever gimmick for creating paths, though. You can also mine different resources on the board like gold, gems, and diamonds to help pay for things, so choosing the right path through a level often means sacrificing a long, windy path for a gem deposit that will give you a much-needed support tower. On top of that, each level has a map that can be dug up to show you the location of hidden skull parts which allow you to permanently upgrade various things like how much gold you get while mining. 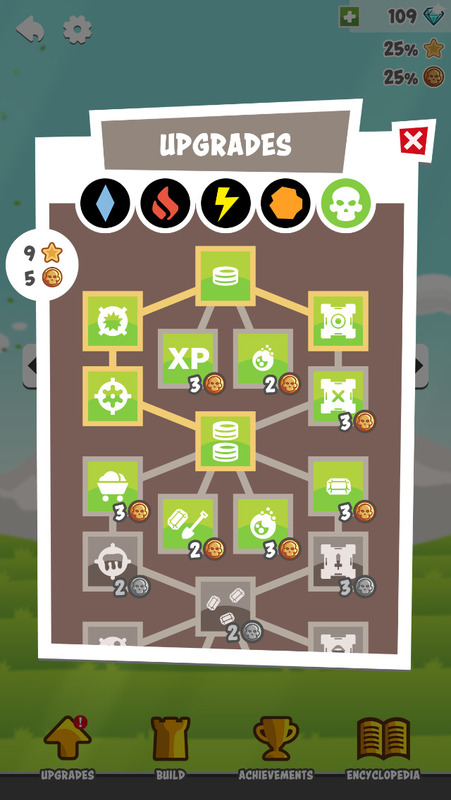 (There’s also a separate set of upgrade paths specifically for towers in the main menu that uses stars instead of skulls, which are earned based on how well you complete each level). The game does all of these things so well that it’s actually kind of hard for me to find anything to complain about. The pay model, I suppose, will probably upset people. It’s free with an ever-present banner ad at the bottom of the screen, and you can spend real money on extra diamonds for power-ups. Fortunately, any purchase removes ads permanently, and I’ve progressed quite far in the game without using any power-ups (and now have more diamonds saved up than I’d ever need). Also, the visuals seem very similar to the art style of the Kingdom Rush games, which is a bit disappointing since it seems like roughly 50% of all the tower defense released in the last few years have done the same thing. Those problems are all pretty tiny, though. Digfender is easily one of the best tower defense games I’ve played in a long time, and I’ve played more than I can count. All of the various systems in the game come together in a delightful mix of clever new ideas and familiar tried and true concepts. The difficulty curve is pretty solid as well, and it’s tons of fun replaying earlier levels with more and more upgrades to collect all the stars and skulls. Don’t let the fact that it’s free turn you away. This one’s a keeper.